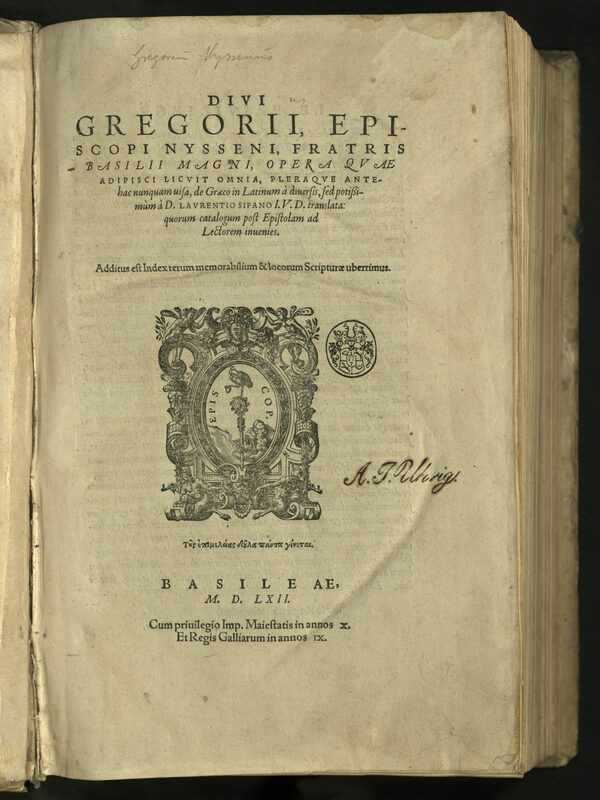 This is the most complete Latin translation of the works of Saint Gregory, Bishop of Nyssa, to its time, and the first translated by philologist Laurentius Sifanus (ca. 1510-1579), who taught at university in Ingolstadt. 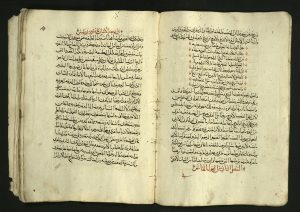 The translation has been found by modern scholars to be faithful to manuscript copies of the text. 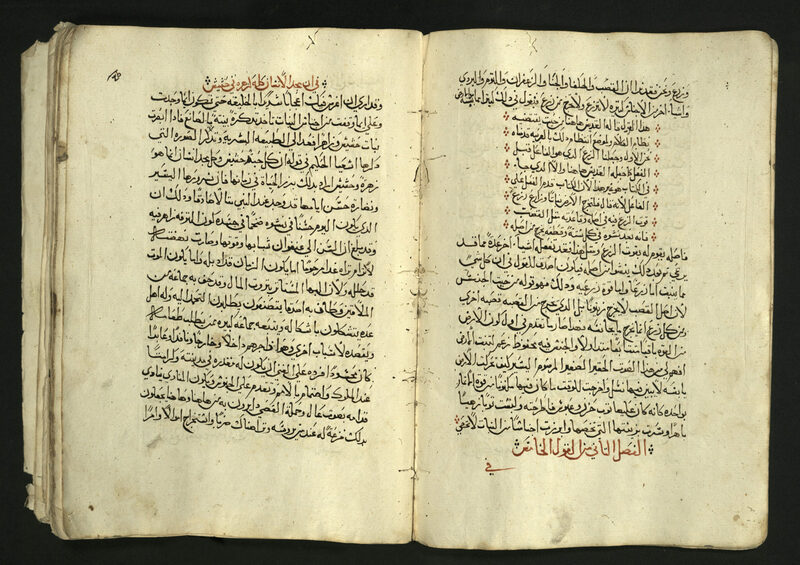 Printed marginal references to passages from the Hebrew Bible and the New Testament are throughout the book. 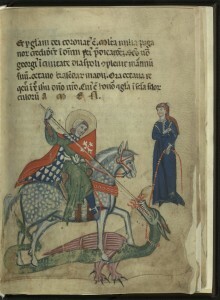 Gregory of Nyssa (ca. 335-ca. 395) was born in Cappadocia, modern-day Turkey. An erudite theologian, he made significant contributions to the doctrine of the Trinity and the Nicene Creed. He was strongly influenced by Origen (ca. 185-254) and the Jewish philosopher Philo of Alexandra (ca. 20BCE – ca. 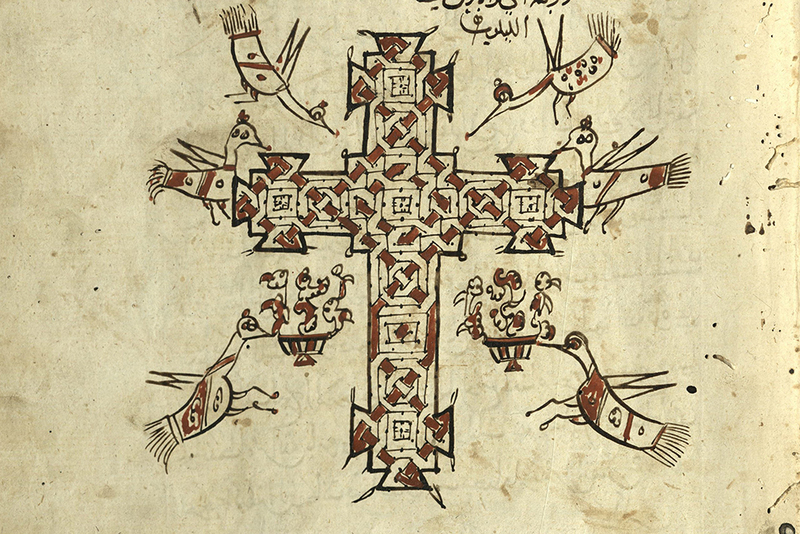 54CE). He and his older brother, Saint Basil, are credited with defining Christian orthodoxy in the Eastern Roman Empire just as Augustine (354-430) was to do later for the Western Roman Empire. It is likely that Gregory was taught by his older brother Basil, who attended school in Constantinople and Athens. Gregory drew inspiration from pagan Greek philosophy as well as Jewish tradition. He was well-acquainted with the works of Plato (427-347 BCE) and Aristotle (384-322 BCE). Basil established a monastery in Pontus, which he directed for five years. He wrote a monastic rule still practiced by monks of the Eastern Orthodox Church. Basil was the leader in the fight against Arianism (which denied the divinity of Christ). Both Basil and Gregory were very close to their sister, Macrina, who also attained sainthood in the Eastern Orthodox Church. After Basil and Macrina died, Gregory continued Basil’s fight against Arianism. He participated in the Council of Antioch against those who refused to recognize the perpetual virginity of the Mother of God. He visited the churches of Palestine, where he asserted the Orthodox teaching about the Most Holy Theotokos, and visited Jerusalem. In 383, he participated in a Council at Constantinople, where he preached a sermon on the divinity of the Son and the Holy Spirit. He returned to Constantinople in an official capacity twice more before his death, sometime around 395. 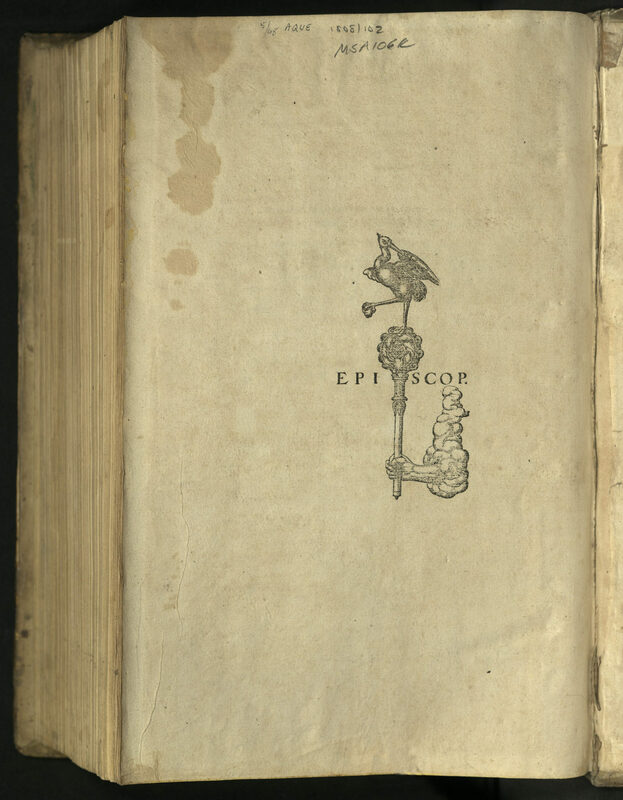 Printer-publisher Nicolaus Episcopius the Younger of Basel used a printer’s device that featured a crane, the symbol of watchfulness and discernment. The crane holds a stone in one of its claws so as not to fall asleep. A hand extending from a cloud grasps a bishop’s crozier upon which the crane is perched. Written across the top of the staff is EPISCOP, a shortened form for the Latin word for bishop, and a play on the name of the printer, a latinized form of the name Bischoff. Nicolaus Episcopius the Elder married Justina Froben, daughter of the well-known printer Johann Froben. 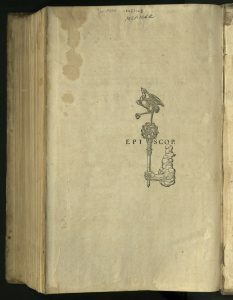 Episcopius the Elder printed in partnership with Hieronymus Froben, son of Johann. Nicolaus the Younger learned to print in his father’s shop. Between 1553 and 1565 he concentrated on printing editions of the classics, philosophy and history, including the works of Philo, Livy and Sir Thomas More. His interests were very much in line of other important printers of the time. Large woodcut device on title, woodcut printer’s device on verso of last leaf. Woodcut historiated initials throughout. 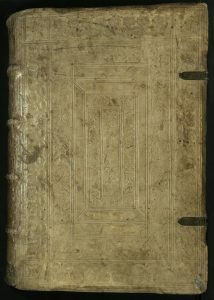 Rare Books copy bound in contemporary pigskin over wooden boards, covers tooled in blind with roll-tools. Three of four brass catches remain, clasps lacking. 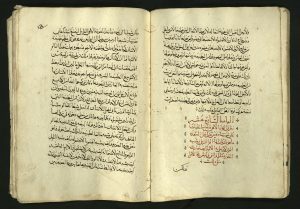 This manuscript, written on polished laid paper, is an Arabic translation from a Greek or Coptic original of writings by St. Basil the Great and St. Gregory of Nyssa. 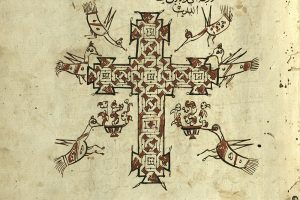 It is written in large naskh script and contains an illumination of the Coptic Cross, surrounded by birds between the texts of the two books of commentary. 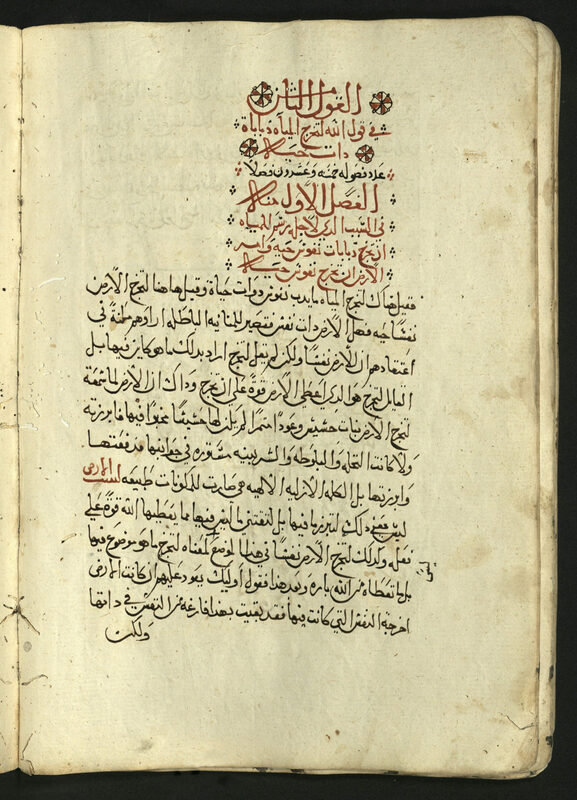 Beginning sections of text are marked with red ink for the text, framed by diamond-shaped lozenges in red and black. 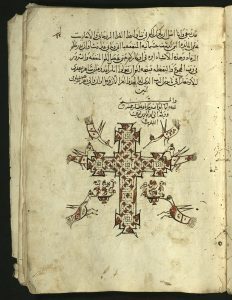 Although the manuscript is undated, the motifs and painting style are typical of Egyptian illumination of the early 9th c. AH/15thc. CE. St. Basil the Great was born in Caesarea, the metropolis of Cappadocia. 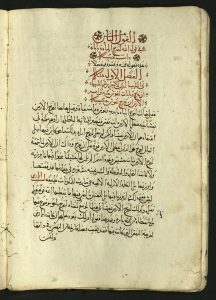 After he attended school in Constantinople and at Athens he opened an oratory and law practice. Soon afterwards, he established a monastery in Pontus, which he directed for five years. He wrote a monastic rule which would become the longest lasting of those in the Byzantine East, still practiced by monks of the Eastern Orthodox church. St. Basil was one of the giants of the early church. He was responsible for the victory of Nicene orthodoxy over Arianism (which denied the divinity of Christ) and the denunciation of Arianism at the Council of Constantinople in 381/82. St. Basil’s brother, Gregory became a Christian in his early twenties. Married, he went on to study for the priesthood. He was elected Bishop of Nyssa (in Lower Armenia) in 372. Gift of Dr. Aziz and Mrs. Lola Atiya. 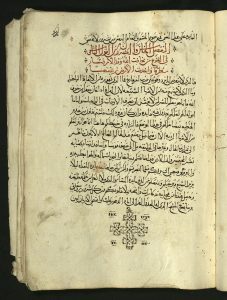 Facsimile. 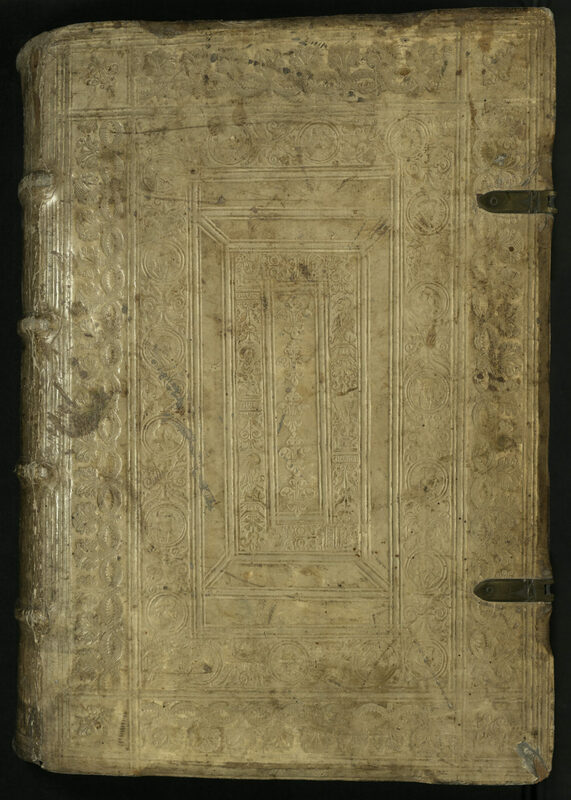 This illuminated manuscript belonged to a young woman of the Veronese aristocracy. 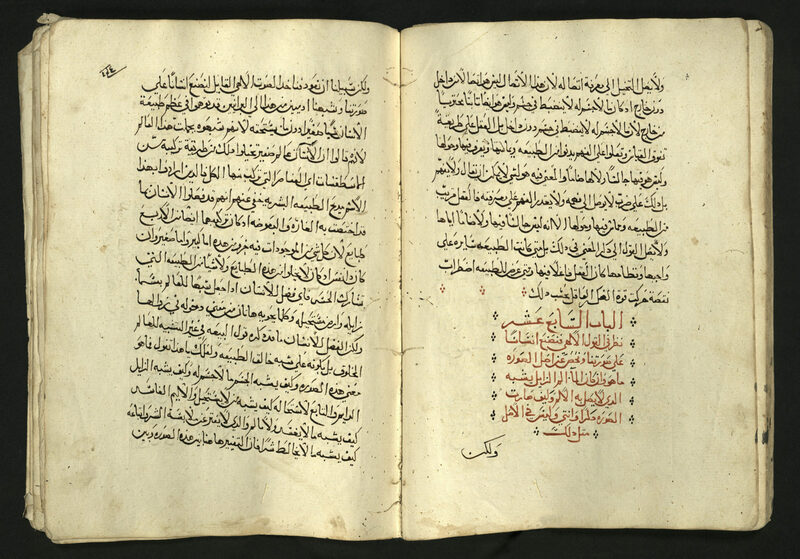 Produced on vellum in the second half of the thirteenth century, it is illustrated throughout with miniatures and consists of forty-two folios, or eighty-four pages. 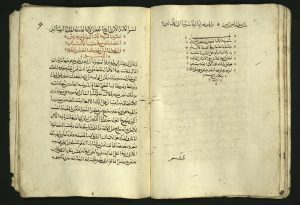 The first two folios are written in a Gothic semi-italic hand. The text is a prayer to the Virgin Mary and one of the oldest known prayers written in the Veronese vernacular. 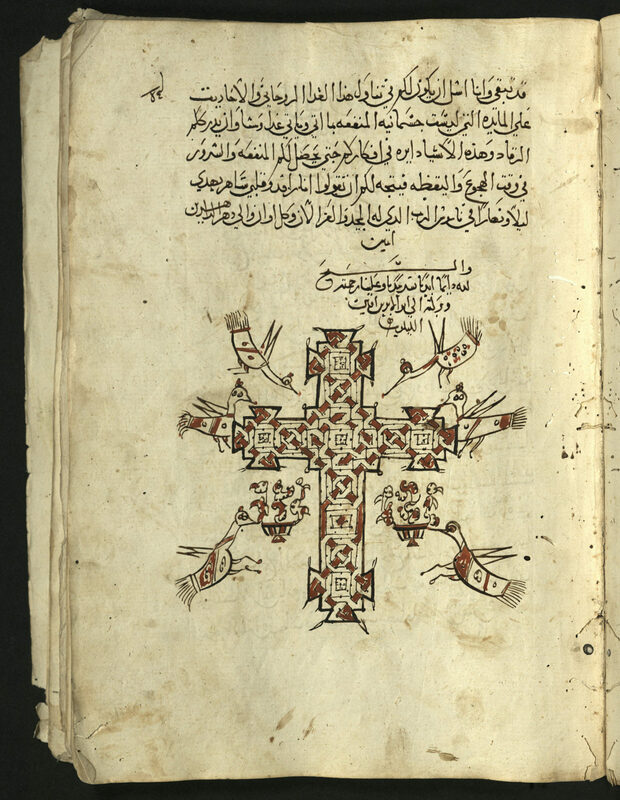 The rest of the manuscript consists of the legends of Saint George of Cappadocia and Saint Margherita of Antiochia. The script for the legends is Gothic rotunda. At the end of the manuscript are two full page illuminations: Christ in Majesty surrounded by the four evangelists, and Saint Christopher. 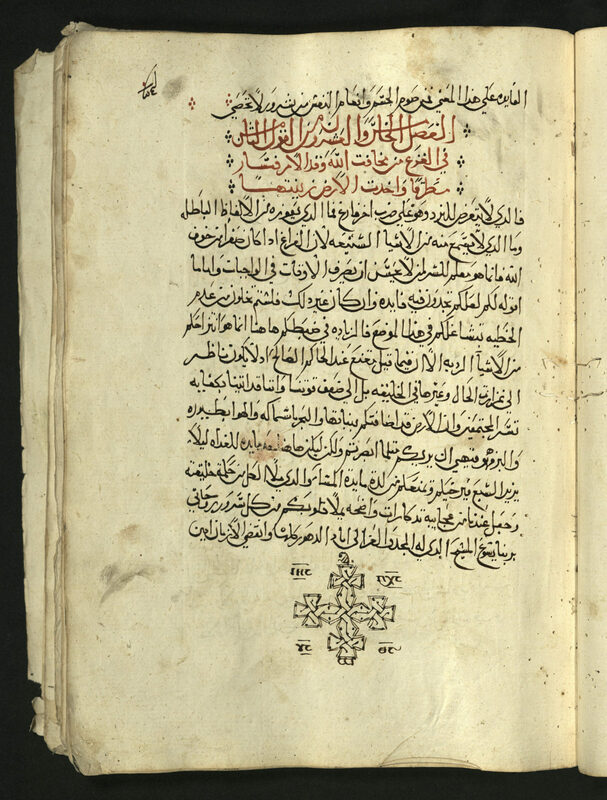 A note of ownership indicates that the manuscript was entrusted to the Monastery of Santa Maria Maddalena in 1350. This monastery thrived between 1200 and 1300 as a harbor for young women. Graphic miniatures illustrate the story of the tribulations of George of Cappadocia, from the time he declared to the Emperor Diocletian his Christian faith, until, after seven years of torture, he was beheaded for not recanting. 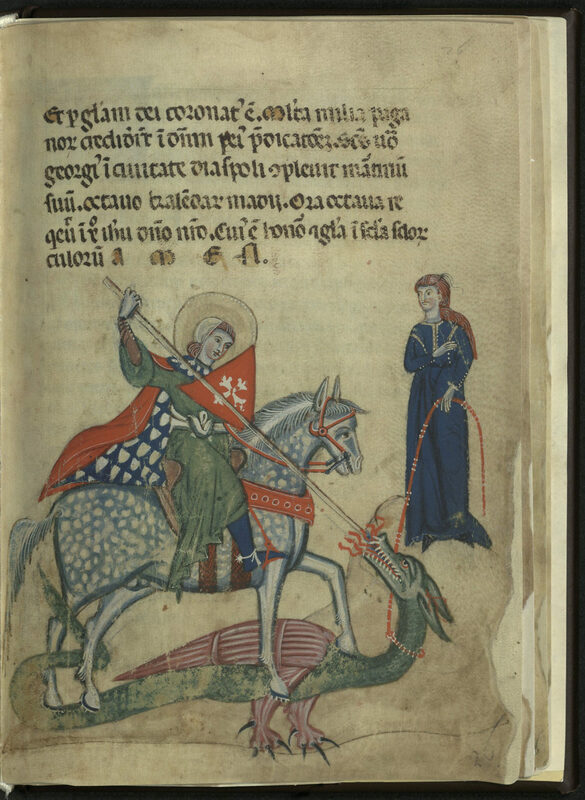 The story ends with an illumination for which this legend is best known: St George astride a horse, piercing with a lance a dragon led on a leash by a princess. In 1435 the painter Pisanello used this subject on his fresco in the church of Saint Anastasia in Verona. Georgius (ca. 275-23 April 303), born of a Roman army officer from Cappadocia (present-day Turkey) and a Syrian mother, served as an officer in the Roman army. The legend of the holy Margherita, a shepherdess of Antiochia, tells the story of the prefect Olibrio, who falls in love with Margherita. Her refusal of his advances was deemed an act of rebellion against the Roman Empire. Margherita was tortured and beheaded. Her story became a favorite subject of Christian art, in both the East (tenth century frescos adorn a church in Goreme, Cappadocia) and in the West, including a painting by Tiziano in 1550. 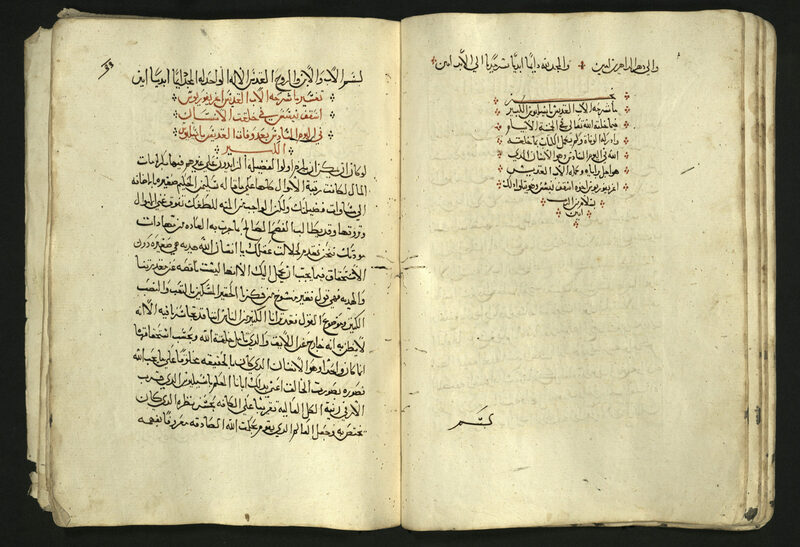 The manuscript is an exceptional example of early interconnection between text and illustration, as small paintings weave in and out amidst the written word. This interplay of text and image was used as an instrument in helping the viewer, if not the reader, comprehend the divine message.